At a press conference of the 10th year celebration of Rang De Basanti, Bollywood superstar Aamir Khan answered the rumors about the second installment of the 2009 blockbuster movie, '3 Idiots'. Aamir Khan said that the idea of the sequel is currently being considered. Prior to that, according to a post on The Malay Online website, '3 Idiot's' director Rajkumar 'Raju' Hirani already had given Khan a hint about the ‘3 Idiots’ sequel. Khan said that the sequel is possible only if and when Hirani will write the script therefore everyone should keep their fingers crossed. ‘3 Idiots’ has been an international blockbuster movie that it was remade in Tamil in 2012 entitled, ‘Nanban’ and Stephen Chow will produce its Chinese remake soon. This movie mainly focused on the education system in India which Aamir Khan’s character, Rancho (Phunsukh Wangdu), had said to be like a caste system. Rancho, despite his brilliance, befriended his (mostly below) average roommates and together, they explored life as engineering students and grown-ups. But for the meantime, Aamir Khan is focusing on his current movie ‘Saala Khadoos’ and his next project ‘Dangal’ where he needs to shed off 25 pounds to look younger which this movie requires him to be. Khan professionally said that, though, it is hard to gain and to lose weight, an actor’s body is his tool to represent a role nicely therefore he has to do it. Did you know that Aamir Khan is dubbed as perfectionist? He doesn’t make two projects at the same time, making him concentrate better on them. Having said that, it looks like the sequel, we all are waiting for, will be taking its time. 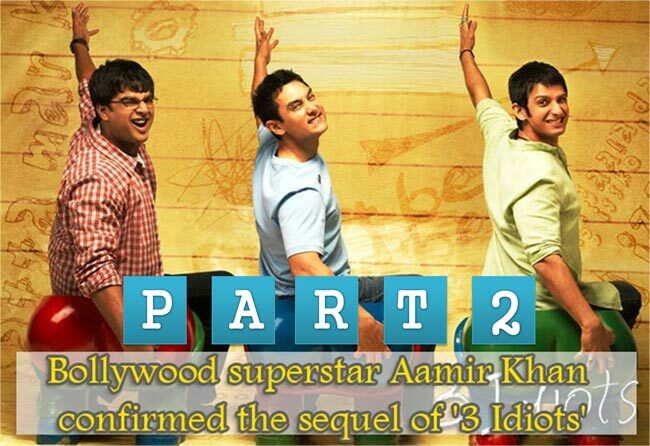 But one thing is for sure, like his other movies, Aamir Khan won’t disappoint us once this ‘3 Idiots’ sequel be finished.